ABUNDANCE’s alluring scent holds a rich tale of wealth and luxury. The oriental feel of the perfume originates from its divine mixture of Frankincense and Rose Geranium, the flower, adding a gentle sweetness that warms the soul. The uplifting touch of citrus, however, comes from Grapefruit, cleverly mixed into the thick, seductive aroma. Nevertheless, the sweet and warm scent is not without a rich undertone, alluding to a time of old, exotic kingdoms abundant with decadence. Abundance is an uplifting scent of fresh and sweet citrus (Grapefruit & Rose Geranium) with a warm, deep and soothing undertone (Frankincense, Patchouli & Clove). People who like the scent of citrus/orange/grapefruit, geranium or frankincense would like Abundance. Most people find it refreshing, uplifting yet also warm and soothing. Read reviews below (on this page) and on the Press page. 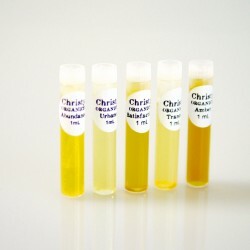 *cumulatively for 12mL & subject to skin type, activity undertaken and weather condition. Roll-on Perfume 12mL or ~ 0.4 fl.oz. Our natural perfumes are dynamic and evolving, when applied, the scent evolves on the skin and you will smell different aroma and notes over time. You will smell Grapefruit upon application, Rose Geranium and Clove within 15 minutes and Frankincense and Vanilla within 20-30 minutes. 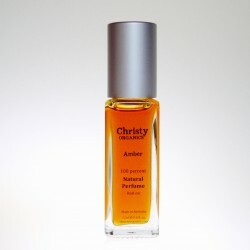 To use a Christy Organics perfume, shake the bottle, then apply the roller ball applicator to pulse points such as the inside of wrists, behind your ears, on your neck and sternum (avoiding face and eye areas). You may also apply to the ends of your hair (keeping hair away from face and eye areas). The heat of your skin will activate the natural aromatics and plant concentrates, releasing a uniquely captivating scent while the organic jojoba oil melts into your skin. Our proprietary formulated perfumes are designed to transcend gender, nationality and culture; enchant and uniquely evolve on the skin of the wearer while giving a luxurious feel. 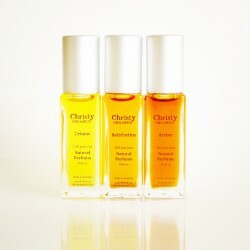 Christy Organics perfumes are dynamic and evolving. When applied, the perfume creates a unique experience as the notes unfold and evolve with your body chemistry and heat, unfolding the layers of notes while it transforms into a scent that is uniquely yours. Drydown is unique to every person as the natural fixatives and essences in the perfume interact with each person's body chemistry/heat and skin type differently. The scent generally lasts three to five hours on your skin and you may reapply as required. You may find tiny particles or sediment in the perfumes; they are naturally occurring material from the 100% natural plant ingredients that we use and not impurities. It is recommended that the perfumes be used within 12 months after opening as our perfumes are formulated without synthetic preservatives or additives. 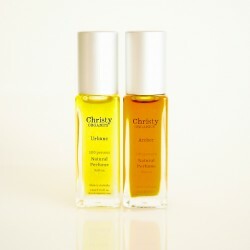 For the same reasons, Christy Organics perfumes are best stored below 30°C and away from direct sunlight. CAUTION: For external use only. Avoid using on skin exposed to sunlight or ultraviolet light. Avoid contact with eyes and face. Do not apply to broken, irritated or itching skin. Discontinue use immediately and seek medical advice if irritation occurs or you have an allergic reaction. As with all products containing essential oils, please consult your healthcare practitioner or doctor before using this product if you are epileptic, pregnant, lactating or if you have allergies. While essential oils are all-natural, they should be used with care. Keep out of reach of children. 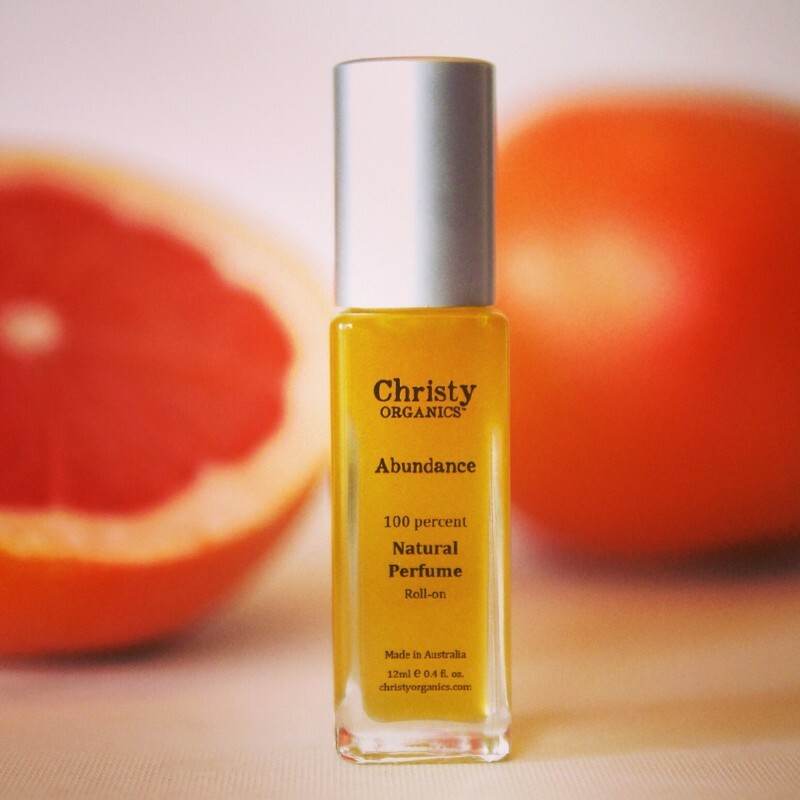 Abundance Perfume, Simply Love It! I am so thankful to own 'Abundance', it's perfect warm-sweet scent gives me that cozy, enliven feeling and is a delight to my nose. It's like standing in a tropical garden and the flowers give off their electrifying aroma after it has rained, all natural and original. Simply love it! Wonderful product. I use this regularly to yoga and I am loving it. I was looking for something 100% natural and this fits in. Nice scent, not too strong. I feel clean, fresh, calm and smoothing. 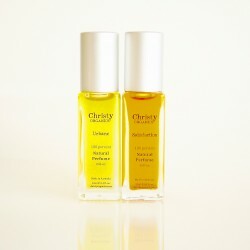 Reliable organic perfumes are hard to come by, so imagine my delight when I discovered Christy Organics' fantastic range of organic perfumes. I started with Abundance, which has a refreshing yet rich scent. And after a few minutes on the skin, the scent evolves to another tone. Very unique indeed! I've just ordered the new sample pack of five. I can't wait to try them all! I got a sample of this and I was surprised. I am used to grapefruit smelling really young and sweet. This perfume is definitely more of soothing scent. I tested it out by putting on my wrists before I sleep. I've found that this makes it clear for me whether the perfume smells good on me. I woke up (8 hours later) and the scent was still strong. Great quality. Fabulous scent which fills me with calm and an inner smile. Customer service from Christy is A1. Thanks for the sample perfume, which is now on my wishlist. I started using "Abundance" couple of days ago and I find it very soothing. It smells herbaceous and therapeutic. I am very sensitive to strong perfume scent and I find this not over powering like other perfumes. 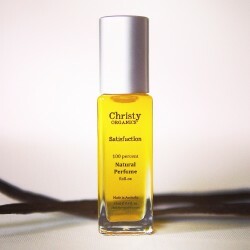 Thank Christy for your great recommendation. 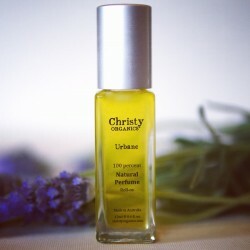 I have been on the hunt for an organic, natural perfume and this one ticks all of the boxes. It smells absolutely gorgeous and lasts for hours. 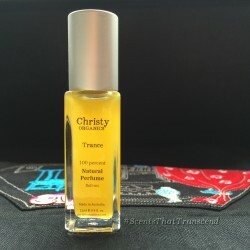 Thank you Christy for this lovingly made scent. My wife is not into the heavy scented perfumes that can be purchased at any cosmetic stores. While visiting Melbourne, we were given the opportunity to sample this unique scent created by Christina. My wife loves the mild scent and yet lingering effects of the perfume. In addition, all her ingredients are made of 100% natural and 70% organic. Love the refreshing and energising scent that lasts for hours......much longer than expected!